1Lt Charles E. Garrett (P) - All missions flown as First Pilot. Mission 284 flown with a combat orientation CoPilot 2Lt Chester G. Judd. 35 mission combat tour completed on 23 March 1945 (mission 344). 2Lt Joseph L. A. Castillo, Jr. (CP) - Twenty-six missions flown with 1Lt Garrett (285, 286, 287, 291, 292, 293, 294, 295, 296, 297, 300, 301, 302, 303, 304, 307, 312, 313, 314, 320, 332, 334, 335, 336, 338, 342) and nine missions with other Pilots (284, 310, 311, 315, 316, 324, 341, 343, 344). 35 mission combat tour completed on 23 March 1945 (Mission 344). Promoted from F/O to 2Lt on 23 March 1945. 2Lt John R. Magner, Jr. (N) - Fifteen missions flown with 1Lt Garrett (284, 285, 286, 287, 291, 292, 293, 294, 295, 296, 297, 300, 301, 302, 303). Became a Lead Crew GH Navigator and flew on six missions in this crew position (316, 323, 331, 332, 336, 343). Completed twenty-one combat missions on 22 March 1945 (Mission 343). Promoted from F/O to 2Lt on 17 March 1945. 2Lt Andrew T. Reed (B) - Nine missions flown with 1Lt Garrett (284, 285, 286, 287, 291, 292, 293, 294, 295), two missions with other Pilots (308, 319) and eight missions as a Lead Crew Bombardier (314, 323, 332, 338, 343, 350, 355, 364). Completed nineteen combat missions on 25 April 1945 (Mission 364). Transferred to 359th BS on 23 April 1945. T/Sgt Hollis H. Hohstadt (E), T/Sgt Jessey B. Henson (R), Sgt John Walczak (BTG), Sgt Joseph A. VanCleave (TG) - Flew on 34 missions with 1Lt Garrett (All Garrett missions except 344) and with 1Lt John D. Dorsett on one mission (311). 35 mission combat tours completed on 22 March 1945 (Mission 343). 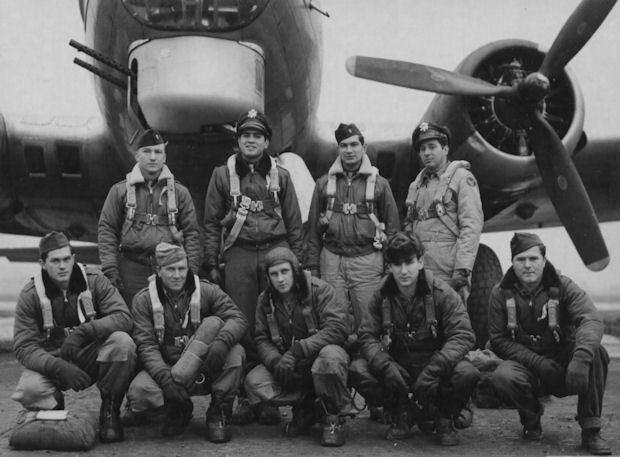 Sgt VanCleave flew on mission 315 as a Waist Gunner with 2Lt Morris L. Dickinson as Tail Gunner/Observer. S/Sgt Charles E. Prudhoe (WG/Tog) - Flew on 34 missions with 1Lt Garrett (All Garrett missions except 323) and with 1Lt John D. Dorsett on one mission (311) and another Pilot on mission 323: As Waist Gunner (20 Missions - 284 through 313 on 9 Feb 45); As Togglier (15 missions - with and after mission 314). Completed 35 mission combat tour on 23 March 1945 (Mission 344).